Tempering chocolate is an essential step for making smooth, glossy, evenly colored, and snappy chocolate. It’s a skill that’s invaluable if you want to do any sort of candy making. Even the simplest chocolate recipes, like truffles, brownies, or chocolate bark can be improved by using tempered chocolate. I have been making my own raw chocolate ever since I can remember. There’s nothing easier than mixing together some raw cacao powder, coconut oil, and maple syrup, letting it set in the fridge for a few minutes and voila – you’ve got raw chocolate in no time. I never quite understood why my chocolate always melted as soon as I took it out of the fridge, but I didn’t care. It was delicious nevertheless. It wasn’t until I enrolled in a course called “Introduction to Chocolate Making” that I heard about tempering chocolate. As soon as I learned the basic rules of chocolate tempering, I wanted to try it out. It sounded easy enough and I had all the ingredients in my pantry. Well, I soon realized how tricky tempering chocolate was. My first attempt at raw chocolate making resulted in chocolate seized up into a stiff, grainy, dull mess. Alright. I had been warned that seizing can happen if even a tiny bit of moisture comes into contact with the chocolate. So the second time I tempered chocolate, I made sure there was absolutely no water in the near proximity. Well, I succeeded at not seizing the chocolate, but this time the chocolate bloomed (aka the cacao butter separated and created a whitish coating on the surface of the chocolate). This was my first humbling foray into the world of tempering chocolate. Since then, I failed at chocolate-making more than I can count on the fingers of one hand. So here are my tips for properly tempering chocolate so you don’t have to fail as many times as I did. There are several ways to temper chocolate. However, there are only two basic principles (methods) everything just builds upon. The first (classic) method is all about manipulating tempering temperatures. 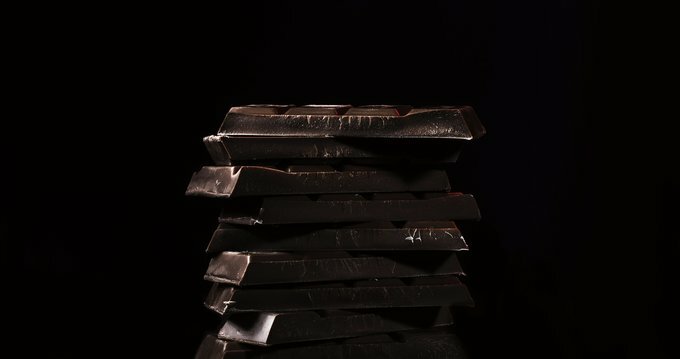 The second (seeding) method requires a piece of already tempered chocolate, which induces the un-tempered chocolate into forming strong, stable (Form V) crystals. While the classic method is less foolproof than the seeding method, it allows you to control all the ingredients that go into the chocolate. In simple terms, tempering chocolate means re-establishing cacao butter crystals. Cacao butter is essentially a solid mass, which turns into liquid when you melt it. Depending on the temperature you heat the cacao butter to (in order to melt it), the cacao butter can form six types of crystals. Unfortunately, only beta prime crystals (Form V) are the ones that produce a chocolate with the best sheen, snap, and taste to it. I – 63°F (17°C) –> soft, crumbly, melts too easily. II -70°F (21°C) –> soft, crumbly, melts too easily. III – 78°F (26°C) –> firm, poor snap, melts too easily. IV – 82°F (28°C) –> firm, good snap, melts too easily. V – 94°F (34°C) –> glossy, firm, best snap, melts near body temperature. VI – 97°F (36°C) –> hard, takes weeks to form. The first step in tempering chocolate is heating the chocolate to 115°F (46°C) to melt all six forms of crystals. To keep the chocolate truly raw, don’t heat it over 108°F (42°C). The second step in tempering chocolate involves cooling the chocolate down to about 81°F (27°C). This promotes rapid formation of both Form V and Form IV crystals. At this temperature, the chocolate is agitated to create many small crystal “seeds” which will serve as the nuclei to create small crystals in the chocolate. When both Form V and Form IV crystals are formed, raise the temperature back up to 88°F (31°C), leaving just the Form V crystals and causing the Form IV crystals to melt. After this point, any excessive heating of the chocolate will destroy the temper and you’ll have to repeat the entire tempering process: melting-cooling-heating. The sugar in the chocolate grabs hold of the water and creates a syrup. The syrup is quite sticky and acts like a glue on the cacao solids, causing them to clump together. The result is that the chocolate stops flowing and turns into a clumpy grainy paste. Wooden tools – all wooden tools, including wooden spoons, wooden bowls, cutting boards, etc. retain moisture and can impart it into your chocolate. Therefore, many confectioners and chocolatiers prefer rubber or silicone utensils, metal bowls, and marble surfaces. Coverings – never ever cover warm chocolate with a lid because the heat from the chocolate can form a condensation on the inside of the bowl. Overheating – chocolate is extremely sensitive to rapid temperature changes. Overheating separates the cacao solids from the cacao butter. So when you heat chocolate above 130°F (54°C), the dry ingredients “burn” (seize up). To prevent overheating, melt chocolate slowly at low temperatures rather than over high or direct heat. Overcooling – when you let your chocolate drop below 81°F (27°C), it forms too many Form III or lower crystals and the chocolate won’t harden properly. Don’t “shock” the chocolate – once chocolate is melted, it doesn’t like to be “shocked” by anything very cold. Using a cold, metal spoon to stir, adding very cold flavorings, even a too cold bowl will make the chocolate grainy, and turn instantly into a hard, solid lump. All your ingredients and tools should be at a room temperature. 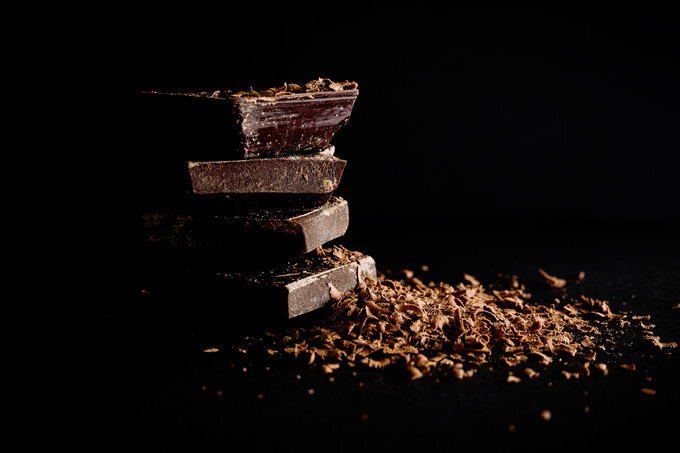 Test the temper – an easy method of checking if the raw chocolate is in temper, is to apply a small quantity of chocolate to a piece of paper or to the point of a knife. If the chocolate has been correctly tempered it will harden evenly and show a good gloss within five minutes. Blooming – there are two types of bloom – sugar bloom and fat bloom. Each has different causes. Sugar bloom – when sugar bloom occurs, you’ll see grains of sugar on the surface of the chocolate. This happens when the sugar crystals are exposed to moisture when stored, either from humidity in the air or condensation from refrigeration. Moisture causes sugar to dissolve and come to the surface. Fat bloom – when fat bloom occurs, you’ll see whitish or gray color on the chocolate. Fat bloom is simply the cocoa butter separating from the cocoa solids and coming to the surface. This usually happens when the structure of the fat crystals changes due to a too-warm or too-cold storage. 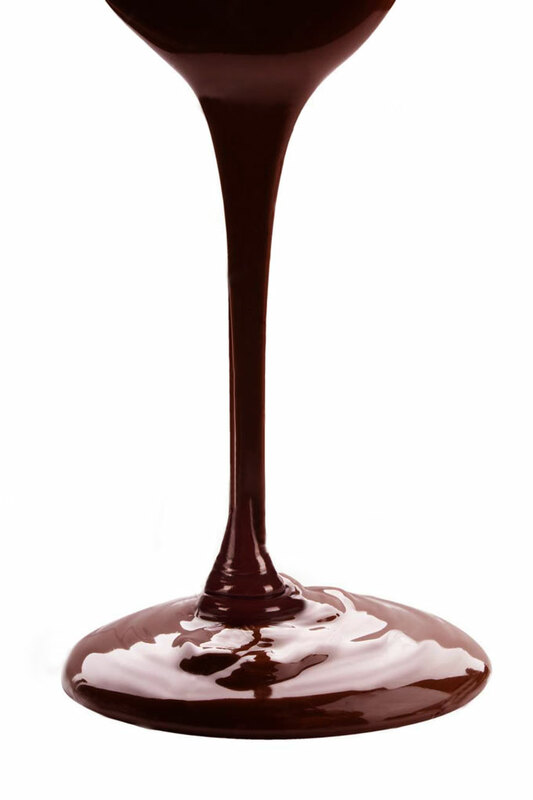 Water – if it was water that brought about the chocolate seize, simply add more water (or any other liquid) to allow the molten chocolate to flow again. You won’t be able to use the recovered chocolate for dipping anymore, but you’ll be able to use it as a chocolate sauce or ganache. Heat – If the chocolate seizes passed its recoverable state, you can still use it for cooking or as a candy filling. For the simplest chocolate, you only need three ingredients – cacao powder, cacao butter, and a sweetener. The first two ingredients are pretty straightforward. It’s the sweetener where things get a bit more complicated. If I can give you one piece of advice, don’t use liquid sweeteners when making tempered chocolate. This includes maple syrup, agave, yacon syrup, brown rice syrup, honey, etc. When making tempered chocolate. The reason is that oil and water don’t mix. When you add liquid sweetener to cacao butter, it causes the cacao butter to seize. You can use small amount of liquids, such as flavor extracts, but no more than ½ tsp per 450 g batch of chocolate. So what sweeteners can you use? Anything that can be powdered. Coconut sugar is my favorite, but you could also use raw cane sugar or any other granulated sweetener. I usually use my Vitamix (or a coffee grinder) to powder the granulated sugar, which is very important. Sugar doesn’t dissolve in fat so if you use granulated sugar (as opposed to powdered sugar), it will be very apparent in the finished product. Chocolate requires precise temperature control so a thermometer is a must. I use an instant read digital thermometer with a probe, but you can also invest in a laser thermometer. Look for a thermometer with a range of at least 60°F – 130°F (15°C – 55°C). After you get familiar with tempering, you might not even need a thermometer. But if you’re a beginner, I would definitely recommend using one. For manipulating temperatures, you can use a stove top, a microwave, hot baths/ice baths, sous de vide circulator … Basically, anything that works for you. Some people even use a hair dryer or a heating pad! Hi, i found your blog incredibly usefull but i have one question; you said even the slightest amount of water will seize your chcolate, then how can you use a liquid flavoring, wont that also cause it to seize? Or do mean an oil flavoring like essential orange oil or peppermint oil? Hi Sabira – a great question. I should add this info in the actual post 🙂 So yes, NEVER add water-based flavorings to chocolate. Only use a flavoring specially formulated for chocolate (called “chocolate flavorings”). Because these flavorings don’t contain any water, they are quite potent so use them more sparingly then their alcohol-based counterparts. Also, chocolate is very sensitive to temperatures. So when adding flavorings to melted chocolate, make sure the flavoring oil is close to the same temperature as the chocolate. Chocolate hardens when it drops in temperature to mid 70° F, so, if you add a flavoring oil that is room temperature (around 68° F) to melted chocolate (ranging from 88° F– 115° F), you will SHOCK the chocolate and it will SEIZE (get lumpy, get gritty or thicken up and get pasty) and be ruined. Hope this helps 🙂 Let me know if you have any other questions, Sabira. Hi Petra, i just discorvered your youtube channel and your blog. I just love your videos, your recipes, your so sweet 🙂 Thank your for the sharing! And you husband’s interventions are so great, he seems to be so sincere. Aw, thank you so much Luna! You’re so kind and encouraging. I am so glad you found my channel and are enjoying the videos. Your English is very good, BTW 😉 Thank you for stopping by and leaving such a lovely comment! hi petra, i have question. i live in indonesia which is very hot and i check it with my temperature that shows the condition of room temperature in here is about 32 celcius already, so when i try to cool down after i melt the chocolate to to 46 C, its impossible to make it to 27 C, so i tried to use cool water in a bowl and i put it on the bottom of my chocolate that has been melted until it reach 27C , and i heat it again to 31 C, then i put it in my room with air conditioning with temperature of 25C, the next day when i woke up the fat bloom appear and the chocolate is not firm. not sure whats wrong with it, could be the quality of cacao? i use palm sugar and i use blender to make it soft, and i use 100 cacao powdered brand java. When fat bloom occurs, you’ll see whitish or gray color on the chocolate. Fat bloom is simply the cocoa butter separating from the cocoa solids and coming to the surface. This usually happens when the structure of the fat crystals changes due to a too-warm or too-cold storage. The best practice is to store chocolate between 55°F-70°F (13°C – 21°C), ideally with less than 50% humidity. Dampness & condensation results in “sugar bloom” and excessive heat or cold results in “fat bloom.” So the goal is to avoid both. I do have to admit that making chocolate in too warm of an environment is really tricky. Ideally, you environment wouldn’t be above 21°C, which I understand is probably impossible in Indonesia. You can definitely use an air conditioner but again, you don’t want the temperature of your room fluctuate too much when making chocolate. It should be fairly stable so the sugar crystals don’t get compromised. Hi Petra, thank you so much for this great and useful blog post! I tried this out today, and unfortunately my chocolate was not crunchy. I add 25% of cashewmus to the chocolate mass, probably this is the reason for the soft result. Do you have any advise how I can get the chocolate crunchy? Sorry for my bad explanation I created the raw recipe by myself it was a dark one with cacao butter, cacao powder, cashew nut sauce and coconut nectar. Thanks for these tips! I have a question in regards to the taste of the chocolate, what could I add to make the chocolate less dark, dairy and non dairy options if you could recommend anything? Hi Saira – I tend to use coconut milk powder when making “milk” chocolate. The ratio of ingredients isn’t the only thing that is different in milk chocolate (compared to dark chocolate). The tempering temperatures are different as well. I am sorry, I don’t have a recipe for milk chocolate on my website yet, but I am working on it! This is a great guide! You mention different temperatures for the milk chocolate tempering. What are these temperatures? Also do you find the coconut oil in the milk makes the temper difficult? Given that coconut oil is an inhibitor for cacao butter crystals formation. Thanks for the great guide! Hi Lizzy – milk chocolate should be first heated to 105–113°F (40–45°C) and then cooled down to 84–86° F (29–30°C), and then heated back up to 90°F (32°C). I am not sure I understand what you mean by “coconut oil in the milk”. I use cacao butter (not coconut oil) for tempered chocolate 🙂 Let me know if you have any questions. Can you advise me? I have just made my second batch of bean-to-bar dark chocolate…and like the first it has come out with whitish marbled whirls. I am surprised because when I used to make regular couverture chocolate, the end result was great all round. I also conched for 73 hours this time; first time 46. This batch was even grainy compared to the first and the sugar added an hour after conching this time. Can you advise what I can do?